Gerald Joseph "Gerry" Mulligan (April 6, 1927 - January 20, 1996) was an American jazz saxophonist, clarinetist, composer and arranger. Though Mulligan is primarily known as one of the leading baritone saxophonists in jazz history - playing the instrument with a light and airy tone in the era of cool jazz - he was also a notable arranger, working with Claude Thornhill, Miles Davis, Stan Kenton, and others. Mulligan's pianoless quartet of the early 1950s with trumpeter Chet Baker is still regarded as one of the more important cool jazz groups. Mulligan was also a skilled pianist and played several other reed instruments. Mulligan reportedly had a relationship with actress Judy Holliday until she died in 1965, and with actress Sandy Dennis from 1965 until they broke up in 1976. Gerry Mulligan was born in Queens Village, Queens, New York, the son of George and Louise Mulligan. His father was a Wilmington, Delaware native of Irish descent; his mother a Philadelphia native of half Irish and half German descent. Gerry was the last of four sons: George, Phil, Don and Gerry. George Mulligan's career as an engineer necessitated frequent moves through numerous cities. When Gerry was less than a year old, the family moved to Marion, Ohio, where his father accepted a job with the Marion Power Shovel Company. With the demands of a large home and four young boys to raise, Mulligan's mother hired an African-American nanny named Lily Rose, who became especially fond of the youngest Mulligan. As he became older, Mulligan began spending time at Rose's house and was especially amused by Rose's player piano, which Mulligan later recalled as having rolls by numerous players, including Fats Waller. Black musicians sometimes came through town, and because many motels wouldn't take them, they often had to stay at homes within the black community. The young Mulligan occasionally met such musicians staying at Rose's home. The family's moves continued with stops in southern New Jersey (where Mulligan lived with his maternal grandmother), Chicago, Illinois, and Kalamazoo, Michigan, where Mulligan lived for three years and attended Catholic school. When the school moved into a new building and established music courses, Mulligan decided to play clarinet in the school's nascent orchestra. Mulligan made an attempt at arranging with the Richard Rodgers song "Lover", but the arrangement was seized prior to its first reading by an overzealous nun who was taken aback by the title on the arrangement. When Gerry Mulligan was 14, his family moved to Detroit and then to Reading, Pennsylvania. While in Reading, Mulligan began studying clarinet with dance-band musician Sammy Correnti, who also encouraged Mulligan's interest in arranging. Mulligan also began playing saxophone professionally in dance bands in Philadelphia, an hour and a half or so away. Mulligan also studied the blues with Corey Lynn Carter at this point. The Mulligan family next moved to Philadelphia, where Gerry attended the West Philadelphia Catholic High School for Boys and organized a school big band, for which he also wrote arrangements. When Mulligan was sixteen, he approached Johnny Warrington at local radio station WCAU about writing arrangements for the station's house band. Warrington was impressed and began buying Mulligan's arrangements. Mulligan dropped out of high school during his senior year to pursue work with a touring band. He contacted bandleader Tommy Tucker when Tucker was visiting Philadelphia's Earle Theatre. While Tucker did not need an additional reedman, he was looking for an arranger and Mulligan was hired at $100 a week to do two or three arrangements a week (including all copying). At the conclusion of Mulligan's three-month contract, Tucker told Mulligan that he should move on to another band that was a little less "tame". Mulligan went back to Philadelphia and began writing for Elliot Lawrence, a pianist and composer who had taken over for Warrington as the band leader at WCAU. Mulligan moved to New York City in January 1946 and joined the arranging staff on Gene Krupa's bop-tinged band. Notable arrangements of Mulligan's work with Krupa include "Birdhouse", "Disc Jockey Jump" and an arrangement of "How High the Moon" that quoted Charlie Parker's "Ornithology" as a countermelody. Mulligan next began arranging for the Claude Thornhill Orchestra, occasionally sitting in as a member of the reed section. Thornhill's arranging staff included Gil Evans, whom Mulligan had met while working with the Krupa band. Mulligan eventually began living with Evans, at the time that Evans' apartment on West 55th Street became a regular hangout for a number of jazz musicians working on creating a new jazz idiom. In September 1948, Miles Davis formed a nine-piece band that featured arrangements by Mulligan, Evans and John Lewis. The band initially consisted of Davis on trumpet, Mulligan on baritone saxophone, trombonist Mike Zwerin, alto saxophonist Lee Konitz, Junior Collins on French horn, tubist Bill Barber, pianist John Lewis, bassist Al McKibbon and drummer Max Roach. The band only played a handful of live performances (a two week engagement at the Royal Roost jazz club and two nights at the Clique Club). However, over the next couple of years, Davis reformed the nonet on three occasions to record twelve pieces for release as singles. These were eventually compiled on a Capitol Records album, titled Birth of the Cool. Mulligan wrote and arranged three of the tunes recorded ("Rocker," "Venus de Milo," and "Jeru," the latter named after himself), and arranged a further three ("Deception," "Godchild," and "Darn That Dream"). He was also (with Davis, Konitz and Barber) one of only four musicians who played on all the recordings. Despite the chilly reception by audiences of 1949, the Davis nonet has been judged by history as one of the most influential groups in jazz history, creating a sound that, despite its East Coast origins, became known as West Coast Jazz. During his period of occasional work with the Davis nonet between 1949 and 1951, Mulligan also regularly performed with and arranged for trombonist Kai Winding. Mulligan's composition "Elevation" and his arrangement of "Between the Devil and the Deep Blue Sea" were recorded by Mulligan's old boss, Elliott Lawrence. This brought Mulligan additional recognition. Mulligan also arranged for and recorded with bands led by Georgie Auld and Chubby Jackson. In September, 1951, Mulligan recorded the first album under his own name, Mulligan Plays Mulligan. By this point, he had mastered a melodic and linear playing style, inspired by Lester Young, that he would retain for the rest of his career. In the spring of 1952, Mulligan became more desperate for remunerative employment and headed west to Los Angeles with his girlfriend, pianist Gail Madden. Through an acquaintance with arranger Bob Graettinger, Mulligan started writing arrangements for Stan Kenton's Orchestra. While most of Mulligan's work for Kenton were pedestrian arrangements that Kenton needed to fill out money-making dance performances, Mulligan was able to throw in some more substantial original works along the way. His compositions "Walking Shoes" and "Young Blood" stand out as embodiments of the contrapuntal style that became Mulligan's signature. His sound or tone (timbre) was likened to a tweed cloth. While arranging for Kenton, Mulligan began performing on off-nights at The Haig, a small jazz club on Wilshire Boulevard at Kenmore Street. During the Monday night jam sessions, a young trumpeter named Chet Baker began sitting in with Mulligan. Mulligan and Baker began recording together, although they were unsatisfied with the results. Around that time, vibraphonist Red Norvo's trio began headlining at The Haig, thus leaving no need to keep the grand piano that had been brought in for Erroll Garner's stay at the club. Faced with a dilemma of what to do for a rhythm section, Mulligan decided to build on earlier experiments and perform as a pianoless quartet with Baker on trumpet, Bob Whitlock on bass and Chico Hamilton on drums (later Mulligan himself would occasionally double on piano). Baker's melodic style fit well with Mulligan's, leading them to create improvised contrapuntal textures free from the rigid confines of a piano-enforced chordal structure. While novel at the time in sound and style, this ethos of contrapuntal group improvisation hearkened back to the formative days of jazz. Despite their very different backgrounds, Mulligan a classically-trained New Yorker and Baker from Oklahoma and a much more instinctive player, they had an almost psychic rapport and Mulligan later remarked that, "I had never experienced anything like that before and not really since." Their dates at the Haig became sell-outs and the recordings they made in the fall of 1952 became major sellers that led to significant acclaim for Mulligan and Baker. This fortuitous collaboration came to an abrupt end with Mulligan's arrest on narcotics charges in mid-1953 that led to six months at Sheriff's Honor Farm. Both Mulligan and Baker had, like their peers, become heroin addicts. However, while Mulligan was in prison, Baker transformed his lyrical trumpet style, gentle tenor voice and matinee-idol looks into independent stardom. Thus when upon his release Mulligan attempted to rehire Baker, the trumpeter declined the offer for financial reasons. They did briefly reunite at the 1955 Newport Jazz Festival and would occasionally get together for performances and recordings up through a 1974 performance at Carnegie Hall. But in later years their relationship became strained as Mulligan, with considerable effort, would manage to kick his habit, while Baker's addiction would bedevil him professionally and personally almost constantly until his death in 1988. Mulligan continued the quartet format with valve trombonist Bob Brookmeyer replacing Baker, although Mulligan and Brookmeyer both occasionally played piano. This quartet structure remained the core of Mulligan's groups throughout the rest of the 1950s with sporadic personnel changes and expansions of the group with trumpeters Jon Eardley and Art Farmer, saxophonists Zoot Sims, Al Cohn and Lee Konitz, and vocalist Annie Ross. In 1957, Mulligan and his wife, Arlyne Brown Mulligan (daughter of composer Lew Brown), had a son, Reed Brown Mulligan. Mulligan also studied Piano with Suezenne Fordham, who was a member of the inner circle of Jazz players in NY. She was sought out by jazz musicians of the era to coach them to improve their piano technique. She and Mulligan also had a personal relationship from 1966 through 1972. Mulligan also performed as a soloist or sideman (often in festival settings) with a veritable Who's Who of late 50s jazz artists: Paul Desmond, Duke Ellington, Ben Webster, Johnny Hodges, Jimmy Witherspoon, André Previn, Billie Holiday, Marian McPartland, Louis Armstrong, Count Basie, Stan Getz, Thelonious Monk, Fletcher Henderson, Manny Albam, Quincy Jones, Kai Winding, Miles Davis, and Dave Brubeck. Mulligan appears in Art Kane's celebrated A Great Day in Harlem portrait of 57 major jazz musicians taken in August 1958. Mulligan formed his first "Concert Jazz Band" in the Spring of 1960. Partly an attempt to revisit the ornate arrangements of big band music in a smaller setting, the band varied in size and personnel, with the core group being six brass, five reeds (including Mulligan) and a pianoless two-piece rhythm section. The membership included (at various times, among others): trumpeters Conte Candoli, Nick Travis, Clark Terry, Don Ferrara, Al Derisi, Thad Jones and Doc Severinsen, saxophonists Zoot Sims Jim Reider, Gene Allen, Bobby Donovan, Phil Woods and Gene Quill, trombonists Willie Dennis, Alan Raph and Bob Brookmeyer, drummers Mel Lewis and Gus Johnson, and bassists Buddy Clark and Bill Crow. The band also recorded an album of songs sung by Gerry's close friend Judy Holliday in 1961. The band toured and recorded extensively through the end of 1964, ultimately producing five albums for Verve records. Mulligan resumed work with small groups in 1962 and appeared with other groups sporadically (notably in festival situations). Mulligan would continue to work intermittently in small group settings until the end of his life, although performing dates started to become more infrequent during the mid '60s. After Dave Brubeck's quartet broke up in 1967, Mulligan began appearing regularly with Brubeck as the "Gerry Mulligan / Dave Brubeck Quartet" through 1973. Thereafter, Mulligan and Brubeck would work together sporadically until the final year of Mulligan's life. In 1971, Mulligan created his most significant work for big band in over a decade for the album The Age of Steam. At various times in the 70's he performed with Charles Mingus. 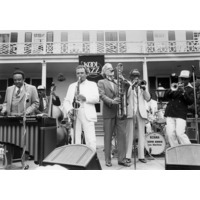 The Concert Jazz Band was "reformed" in 1978 and toured at various times through the '80s. Mulligan, like many jazz musicians of his era, occasionally recorded with strings. Notable dates include 1957 recordings with Vinnie Burke's String Jazz Quartet, a 1959 orchestra album with André Previn and a 1965 album of the Gerry Mulligan Quintet and Strings. In 1974, Mulligan collaborated with famed Argentine musician Ástor Piazzolla. While in Milan for the recording sessions, Mulligan met his future wife, Countess Franca Rota Borghini Baldovinetti, a freelance photojournalist and reporter. In 1975, Mulligan recorded a string album with Italian composer Enrico Intra. Mulligan's more serious work with orchestra began in May 1970 with a performance of Dave Brubeck's oratorio, The Light in the Wilderness with Erich Kunzel and the Cincinnati Symphony. In the 1970s and 1980s, Mulligan worked to build and promote a repertoire of baritone saxophone music for orchestra. In 1973, Mulligan commissioned composer Frank Proto to write a Saxophone Concerto that was premiered with the Cincinnati Symphony. In 1977, the Canadian Broadcasting Corporation commissioned Harry Freedman to write the saxophone concerto Celebration which was performed by Mulligan with the CBC Symphony. In 1982, Zubin Mehta invited Mulligan to play soprano saxophone in a New York Philharmonic performance of Ravel's Bolero. In 1984, Mulligan commissioned Harry Freedman to write The Sax Chronicles which was an arrangement of some of Mulligan's melodies in pastiche styles. In April of that year, Mulligan was a soloist with the New American Orchestra in Los Angeles for the premier of Patrick Williams' Spring Wings. In June 1984, Mulligan completed and performed his first orchestral commission, Entente for Baritone Saxophone and Orchestra, with the Filarmonia Venetia. In October, Mulligan performed Entente and The Sax Chronicles with the London Symphony Orchestra. In 1987, Mulligan adapted K-4 Pacific (from his 1971 Age of Steam big band recording) for quartet with orchestra and performed it beside Entente with the Israel Philharmonic in Tel Aviv with Zubin Mehta conducting. Mulligan's orchestral appearances at the time also included the Houston Symphony, Stockholm Philharmonic and New York Philharmonic. 1988 saw the premier of Mulligan's Octet for Sea Cliff a chamber work commissioned by the Sea Cliff Chamber Players. In 1991 the Concordia Orchestra premiered Momo's Clock, a work for orchestra (without saxophone solo) that was inspired by a book by German author Michael Ende. Throughout Mulligan's orchestral work and until the end of his life, Mulligan maintained an active career performing and recording jazz - usually with a quartet that included a piano. In June 1988, Mulligan was invited to be the first-ever Composer-in-Residence at the Glasgow International Jazz Festival and was commissioned to write a work, which he entitled The Flying Scotsman. In 1991, Mulligan contacted Miles Davis about revisiting the music from the germane 1949 Birth of the Cool album. Davis had recently performed some of his Gil Evans collaborations with Quincy Jones at the Montreux Jazz Festival and was enthusiastic. However, Davis died from a stroke in September and Mulligan continued the recording project and tour with Wallace Roney and Art Farmer subbing for Davis. Re-Birth of the Cool (released in 1992) featured the charts from Birth of the Cool, and a new nonet which included Lewis and Barber from the original Davis band. Mulligan appeared at the Brecon Jazz Festival 1991. Mulligan's final recording was a quartet album (with guests), Dragonfly, recorded in the Summer of 1995 and released on the Telarc label. Mulligan gave his final performance on the 13th Annual Floating Jazz Festival, SS Norway, Caribbean Cruise, November 9, 1995. Mulligan died in Darien, Connecticut on January 20, 1996 at the age of 68 following complications from knee surgery. His widow Franca -- to whom he had been married since 1976 -- said he had also been suffering from liver cancer. Upon Mulligan's death, his library and numerous personal effects (including a gold-plated Conn baritone saxophone) were given to the Library of Congress. 'The Gerry Mulligan Collection' is open to registered public researchers in the library's Performing Arts Research Center. The library placed Mulligan's saxophone on permanent exhibit in early 2009. Mulligan's first film appearance was probably with Gene Krupa's orchestra playing alto saxophone in the 1946 RKO short film Follow That Music. Mulligan had small roles in the films I Want to Live! (1958 - as a jazz combo member), The Rat Race (1960 - in which he appears as a tenor saxophonist instead of playing his usual baritone sax), The Subterraneans (1960) and Bells Are Ringing (1960). Mulligan also performed numerous times on television in a variety of settings during his career. As a film composer, Mulligan wrote music for A Thousand Clowns (1965 - title theme) the film version of the Broadway comedy Luv (1967), the French films La Menace (1977) and Les Petites galères (1977 - with Ástor Piazzolla) and I'm Not Rappaport (1996 - title theme). In 1974 Mulligan collaborated on a musical version of Anita Loos' play Happy Birthday. Although the creative team had great hopes for the work, it never made it past a workshop production at the University of Alabama. In 1978, Mulligan wrote incidental music for Dale Wasserman's Broadway play Play with Fire. In 1995 the Hal Leonard Corporation released the video tape The Gerry Mulligan Workshop - A Master Class on Jazz and Its Legendary Players.